A cost-efficient way to make your brand stand out, swing tags are a great way to add an element of distinction to your brand and allow customers to involuntarily engage with your product through the sense of touch. With promotional material becoming more diverse, its important to strategise about where and how you can prominently display your brand name. It’s not simply advertising where your target market will see it, but realizing that your market brand needs to be spread over a number of mediums to give it maximum impact. Swing tags are an interchangeable promotional product that can be utilised in multiple ways to suit your marketing needs. 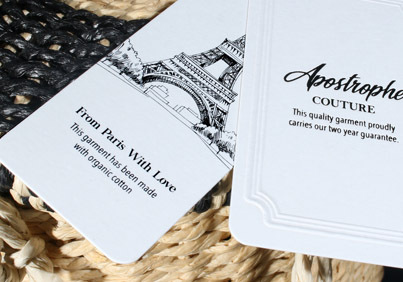 Whether it’s a bottle of wine, or an item of clothing, swing tags can add an element of distinction. With so many products saturating the market, yours must stand out to pique interest. Inktank offers laser fully customised shapes to suit your personal brand. The sky really is the limit with 200 + paper choices, custom shapes, die cuts or laser cutting for intricate patterns that will create stunning visual effect. Why stick to plain hole punching, when you can get creative with the shape of the hole drilling which is available to suit your individual requirements. Included are free downloadable swing tag templates for sizes and customised shapes. Just enough to get your creative juices flowing! Size and shape matters. Think about how much text you want on the tag, and choose a size accordingly. We have included few visual tips and options available in the shape, fold and size. So get creative with your designs. Most common and cost-effective solution. Get creative with your design elements such as shape, size and format, drill hole shape. Multi- layering of tags can add a touch of sophistication and unconventional approach to your brand treatment – such as revealing your logo through die cut shape. Perfect solution when you have additional information you need to include on your tag. You should be! Enjoy browsing our comprehensive paper range selections for full Inktank selection of paper, colours, textures and superb range of finishes. Techniques available including Full colour printing, spot UV, raised ink printing, hot foil stamping, embossing, foiled edging. Limitless choice of available paper colours to match your brand. 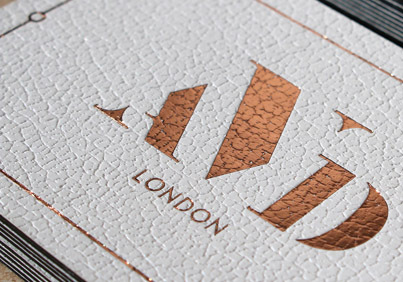 Creative materials such as plastic, suede, velvet, high-matt, wood, cork or leather textured papers are statements to really get your product noticed. 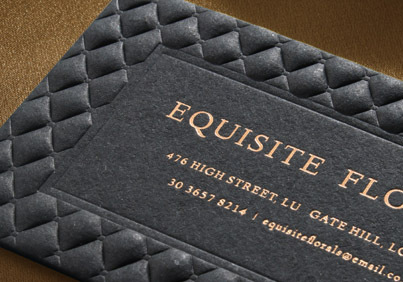 Popular finishing includes hot foil stamping, gilded edging, laser cutting, letterpress, 3D embossing. Swing tags are best presented on extra heavy, thick cards Inktank made significant investments to be able to offer the latest and very best in finishing technologies, such as 3D embossing. Unlimited range of textures and papers, customizable thickness by the way of Duplex/ Triplex finishing. Superb Thickness & Durability, up to 1000 GSM.